It’s probably not a castle like you might expect as it’s a collection of administrative buildings, palaces and churches including the St Vitus Cathedral. The castle is positioned up on the hill above the Mala Strana district and is the seat of the President of the Czech Republic. You can see the changing of the guard at the front gates on the hour every hour. This is an extract from our free Prague City Guide. There are several ways to get to the castle area and the simplest is to walk. You can walk up the steep hill along the tram line, or through a green area in Mala Strana. If you don’t want to walk up the steep hill, take the tram instead – it drops you at the gates of the administrative area in the castle. Notice the pavements in the castle area too, they are ornate with patterns in the stones. 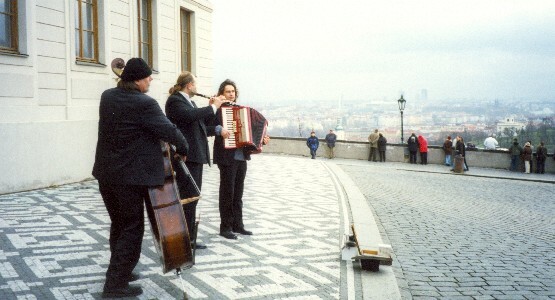 You’ll often find musicians performing in the castle area, as above, and the view back down to the Mala Strana, Old Town and Charles Bridge is really impressive. 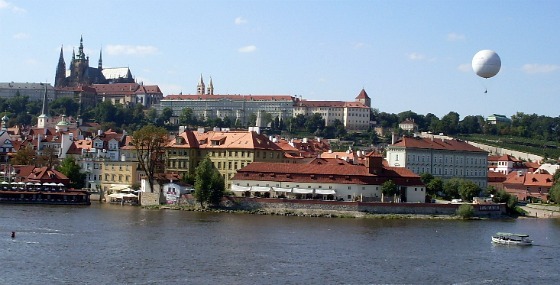 To get the most out of your visit to the castle, you might be interested in the Prague Castle Walking Tour.